On April 24, 2017, the DCI broke my heart. The signs were all there. I even expected it to happen. And although I’ve moved on, and done very well after the breakup, the pain lingers. It’s no secret that Gush was one of my favorite cards of all time. I even wrote a book about it; a book that weaves together Magic theory and practice into a comprehensive guide for designing and playing Gush decks (and also provides a more than introductory survey to wide swaths of the Vintage format, and deep Vintage strategy and sideboard techniques). This article serves as an epilogue to the 3rd Edition of my book, Understanding Gush: Strategies and Tactics. I will explore the future of Gush as a singleton in the Vintage metagame, in theory and practice. But this article is also an autopsy of what happened, of how the third Gush era in Vintage, which lasted six and half (mostly) glorious years, came crashing down. Part history, part strategy, and part prognostication, this article will hopefully serve as a fitting conclusion to that work, not as a tribute or remembrance, but to deepen our understanding and appreciation of how Gush shaped and continues to shape the experience of Magic’s greatest format. Gush and Frantic Search have been in overpowered decks in the past. However, it is not clear that either fits easily in the best performing decks of late, such as Jace, the Mind Sculptor control or various Mishra’s Workshop decks. … Gush was restricted a few years ago. Brainstorm and Merchant Scroll were restricted at the same time, however, and the DCI would like to revisit whether Gush decks can be a healthy addition to the diversity of the format if you can play 4 Gush, but not 4 of either of the other cards. In other words, with Scroll, Brainstorm, and even Ponder restricted, would Gush resume its dominance over the Vintage format? Or, would it, as the DCI expected, play a bit more fairly without the same structural support? Implicit in the announcement was another key point: a factor in the unrestriction decision was that Gush would compete with, rather than enhance, the preeminent strategies in the format. At that time, the Vintage format seemed to be firmly controlled by two cards that had been unleashed earlier in the year: Lodestone Golem and Jace, the Mind Sculptor. The results of the 2010 Vintage Championship bear this out. The finals featured a pair of identical Confidant-Jace decks, and 3rd through 5th place were a trio of Lodestone-powered Workshop decks. In other words, Gush would arrive in the world of Worldwake. Today, there is a kind of historical amnesia in some quarters; a passive or active forgetfulness of how Gush was experienced and performed in the first few years following its unrestriction. Instead, a counter-narrative has set in, that perhaps Gush should never have been unrestricted in the first place. I will let you be the judge of that. Over the years, many Vintage authors and commentators have performed an invaluable service to the Vintage community of collecting tournament data, and presenting the aggregate results and insightful statistics. Taking the baton from me, Matt Elias, erstwhile StarCityGames columnist and Vintage enthusiast, conducted a comprehensive and revealing metagame report for the fourth quarter of 2010. It’s worth reading, not simply to understand his methodology, but because it so vividly describes the Vintage metagame of that time. His clean presentation, clear organization, and detailed analysis remains a model for Magic writers to this day. The important point, however, is that despite the fanfare and clenched teeth, three months later, Gush had a modest impact. It was in this quarter that I started writing the first edition of my Gush book, but, as I noted in the introduction to the 3rd Edition, Gush had “” been paroled in to a hostile environment.” I was candid that Gush was not a top tier deck in the 2010 metagame, but reminded readers that they were learning skills today to take advantage of future metagame cycles. At the end of the day (or, more precisely, the 2010 Q4), Gush was just 8.15% of Top 8 decks, although it was a bit over 17% of tournament winners. Matt broke down Gush’s performance further. Gush was 8% of medium-sized Vintage tournaments, but 8.3% of large tournament Top 8s. It was 7.1% of US Top8s, but 8.9% of European Top 8s. But that was hardly the only way to play Gush. The Europeans enjoyed playing Gush in Mana Drain-Repeal decks with Brain Freeze as a win condition. Gush Tendrils” lists were already emerging. But these decks ran head first in to Workshop-infested waters. In the first few months of 2011, the global Vintage metagame appeared to bisect. In the United States, Workshops surged even further. So much so that Matt Elias regarded “MUD [as] the dominant deck in Vintage.” Gush’s numbers appeared to soften a bit in the United States, but this trend was counter-acted by a spout of enthusiasm for Gush in Europe, where it’s numbers picked up a bit. As a result, Gush rose to 12.75% of Top 8s (and 13% of victories) in 2011 Q1, slightly overtaking the Tezzeret/Jace Control decks, which fell to 9.31% of Top 8s. By now, the clearly preferred set of Gush variants were those that used Yawgmoth’s Will, Tendrils of Agony, and the GushBond engine, anchored by the relatively new printings, Preordain. Some of these lists utilized Voltaic Key/Time Vault and more permission. Others were more aggressive, employing Timetwister, Mind’s Desire, and other combo engines. This trend seemed to persist in to 2011 Q2, where Gush maintained a steady 12.16% of the Top 8 metagame. But Workshops maintained a 22% hold of Top 8s, although it was split among multiple archetypes. It was at this time, however, that a new style of Gush deck emerged, one that was less focused on Brain Freeze or Tendrils. Generally known as “East Coast Wins,” this strategy was an attempt to fuse Gush with Jace, the Mind Sculptor, such that Gush into Jace was a game-breaking play. I took this to a 3rd place finish at the Vintage Championship at GenCon that year, and my MeanDeck teammate Paul Mastriano finished a spot ahead of me. The inimitable Chris Pikula then won a large East Coast tournament shortly thereafter, in which he called the deck 4-3-2. Notably, however, Rich Shay also Top 8’ed the Vintage Championship that year, along with Paul and myself, playing Gush decks. In the course of a year of unrestriction, Gush decks steadily climbed from 8% of the Vintage metagame to 22.5%. However, that proved unsustainable, and by year’s end Gush had fallen to 15% of Top 8s. Although 2011 Q4 was not as successful for Gush decks in terms of tournament performance, Innistrad birthed new weapons for Gush strategies that would diversify the archetype. In particular, I Top 8’ed the Waterbury that Fall with Maniac Doomsday, the “hot” new Gush deck covered in Chapter 11 of Understanding Gush (the “Gush Hall of Fame”). This deck leveraged Gush for massive synergies with Doomsday and Laboratory Maniac. In addition, Matt Elias found great success with Mystic Remora and Tarmogoyf in Gush decks during that time period. The other major development was the incorporation of Delver of Secrets in to Gush shells, which Jimmy McCarthy used to win a local tournament that December. Few of these decks seemed to stick. Brian DeMars regarded my Doomsday deck as a “pet deck,” and by the end of 2012 Q1, Gush had fallen to 10.2% of Top 8s. By 2012 Q2, Gush improved somewhat to 14.8% of Top 8s, but its fortunes seemed bleak. The printing of Griselbrand gave Oath decks new life, and Slash Panther was adopted by trendy Workshop decks for quicker kills against Jace decks. Gush was caught in a vice between all of these strategies. Even Fish decks were beginning to demonstrate a capacity to outflank Gush. The conceptual breakthrough for this deck wasn’t the use of Tarmogoyf, Delver, or even Lightning Bolt to combat Jaces and Slash Panthers. It was the abandonment of black, and the Fastbond + Yawgmoth’s Will combo, and all of the other ancillary parts of the GushBond engine. Mike wrote a pair of useful primers on this deck, in his usual outlandish style. With RUG Delver, Gush decks were becoming much “fairer,” in the sense that they had lost their usual combo-finish flair. But they also became much more consistent as well, and more linear in the process. The success of this archetype led Gush decks to surge to 21.6% of Top 8s. Many of the top players in the format played this deck in the 2012 Vintage Championship. But it was there that this deck, and Gush more generally, finally hit a wall. The resulting Top 8 was 4 Workshop decks, 2 Dredge decks, and a pair of Confidant-Jace decks (including in the winner Marc Lanigra). Zero Gush decks made Top 8, and that trend continued through the end of the year, as Gush decks fell to their lowest ebb since the 2010 unrestriction, at just above 6% of Top 8s. RUG Delver had changed the game, but the game changed back. In the first half of 2013, Gush decks rebounded somewhat, and hit 12.5% of Top 8s in both Q1 and Q2, but was hardly the center of attention or focus of energy. Even I had moved off of Gush, following the unrestriction of Burning Wish in late 2012. There were two notable peaks, but for the most part, Gush was between 5-15% of Vintage Top 8s, with an average of 14%, a very healthy place to be. Three years in to the Gush experiment, all seemed to be working well. The winner of the 2013 Vintage Championship was Joel Lim, in a stunning victory with Merfolk. But the archetype that seemed to have its fortune’s change most from that event was RUG Delver. By now, however, RUG Delver was not only better tuned, but far better positioned in the metagame. Northeast Control players had been loading up on UW Angels and BUG Control (using Abrupt Decay and Deathrite Shaman). RUG Delver was the perfect predator for these strategies, and was also strong against everything else with the red and green suite of artifact and enchantment removal. The most important development, however, was the printing of Young Pyromancer in M14 in late July. Young Pyromancer was the best growing creature printed yet, and its horizontal growth potential overcame the spot removal problem that frustrated Tarmogoyf players. Missteping a Plow or Bolt with Pyromancer in play now became a major tempo threat. Pairing Young Pyromancer with Delver proved to be a dynamic duo. As a result, Gush decks surged back to 20% of Top 8s in 2013 Q3, and even further to 21.25% of Top 8s in 2013 Q4. But just when things seemed to settle, the rug was pulled out from these decks, pun intended. In 2014 Q1, Gush decks collapsed to 11.1% of Top 8s, and then halved again in Q2, to 5.4% of Top 8s, their weakest performance yet! 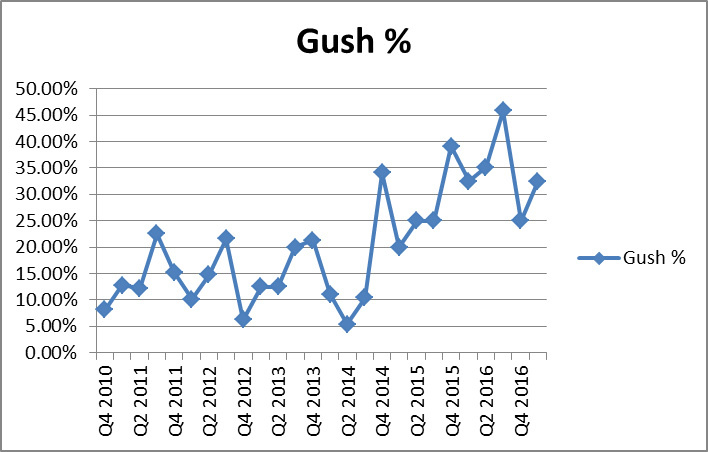 Three times in four years, Gush had surged above 20% of the metagame, but each time had fallen back to single digits (or nearly so). There was, however a critical development in the summer of 2014: the printing of Dack Fayden. The greatest thief in the multi-verse took the format by storm. I Top 8ed the NYSE II that summer with RUG Delver, incorporating Dack. Although my linked list does not illustrate it, Dack was another revolutionary step in the archetype. With Dack and Young Pyromancer, the archetype could now theoretically abandon green from its mana base altogether, and go straight blue-red. I kept a tiny splash of green for Ancient Grudge, Nature’s Claim, and a pair of Trygon Predators, but it was no longer strictly necessary. Yet, even with Young Pyromancer and Dack Fayden at the helm of the best Gush deck, Gush decks only modestly improved their performance to 10.4% of Top 8s in 2013 Q3. Nonetheless, with this deck, I was able to make it to the finals of the first season of the Vintage Super League that fall. The other shoe, however, was about to drop, and Vintage was about to be changed forever. For exactly four years, Gush decks had enjoyed its fair share of successes and victories in the Vintage format. It had risen three times above 20% of the Top 8 metagame, but averaged 13.55% in that that period. That era of good Gush feeling was about to draw to a close. Gush decks had benefited from many printings over those four years, from Delver to Grafdigger’s Cage to Young Pyromancer to Dack Fayden, but, remarkably, none of those had been able to push Gush into a dominant position nor create a truly reviled Gush deck. Khans of Tarkir introduced a pair of cards that would push Gush decks into the stratosphere, and beyond. These two delve spells were perfectly integrated into the Gush decks of the era, and helped transform aggro-control strategies like RUG Delver and UR Delver into dominant decks. The cantrips and free and efficient countermagic all filled the graveyard to make these delve spells effectively Ancestral Recalls, if not better. In 2015 Q4, Gush decks surged from 10.4% of Top 8s to a record breaking 34.1% of Top 8s, epitomized by the four Gush decks in the Top 8 of the Vintage Championship that year. This seemed to restore some semblance of order, and by the end of 2015 Q1 Gush decks had fallen back to a manageable, but still strong, 20% of Top 8s. Treasure Cruise was replaced by Dig Through Time in most of these Gush decks. Although they didn’t seem quite as aggressive or obnoxious with Dig instead of Cruise, there was an additional compounding factor. Fate Reforged, the first expansion set in Khans block, introduced what would become an equal menace to the health of Gush decks (and the format): Monastery Mentor. I quickly incorporated Mentor in my Gush deck on the Vintage Super League, in a shell that I felt was one of the most broken decks in the history of the format, although I went 0-3 that semester in the league. Although I hadn’t had time to perfectly tune the deck, I was confident that this deck, or something like it, was not only the best deck in the format, but the future of the format as well. Once players started refining Mentor decks, often buffered with either Delver or Young Pyromancer, it began to win tournaments. By the end of 2015Q2 Gush decks had risen to 25% of Top 8s. MTGO Daily Event results increasingly shaped the perceptions of many Vintage players, and Mentor decks, as well as a smattering of other Gush decks, continued to put up numbers, and Gush hit 25% of Top 8s in 2015 Q3 as well. Although Brian Kelly won the Vintage Championship that quarter with Oath, a pair of Gush decks made Top 8, matching their proportion in the broader Top 8 metagame that quarter. Here is where things turned ugly. The restriction of Chalice appeared to have hurt Workshop strategies more than the restriction of Dig hurt Gush decks (many Gush decks only ran 1-3 Dig in the first place), and Gush decks surged in 2015 Q4 to a whopping 39% of Top 8s, in both paper and online. That Fall, at the urging of Rich Shay and myself, Wizards announced a regular monthly Vintage Power Nine Challenge for Magic Online. These challenges brought another large Vintage tournament to a global player base, and would become a part of the Vintage data set, and would eventually heighten the perception that the format was increasingly troubled. The issue, it turned out, was that the Khans delve spells were still format defining, even while restricted. Even restricted, the Dack-Delve engine could be used with all of the other draw, filtering, and cantrips, to find another. And with recursion such as Jace, Vryn’s Prodigy or Snapcaster Mage, they could be easily replayed for an additional boost. Unfortunately, that just made things worse. As with the restriction of Chalice, many Workshop players temporarily abandoned the archetype, and Gush decks rose back to 35.1% of Top 8s in 2016 Q2, and then a truly astonishing 45.8% of Top 8s in 2016 Q3, a level not seen of a blue draw engine since Thirst for Knowledge in 2009. At this point, the writing was on the wall. Something needed to happen, but what? Some talked about the need to restrict Mental Misstep, some on Gitaxian Probe, and others focused on Gush. And I began to suggest that Monastery Mentor and/or Preordain were reasonable restrictions to try to address this problem. Part of the problem, as this historical retrospective reveals, is that Wizards weakened the pillar that best held Gush decks in check. But new printings for Workshops had made that necessary, as the 2015 Vintage Championship Top 8 had suggested. Once again, however, Workshop decks regrouped. The discovery of Eldrazi as a metagame player, several months after Oath of the Gatewatch had introduced them, led to new Thorn of Amethyst-based decks in the metagame to attack Gush. The 2016 Vintage Championship was won by Landstill, but there were 5 Thorn decks (3 of them being Workshop decks) in that Top 8, and only 1 Gush deck. Accordingly, Gush fell back to 25% of Top 8s in 2016 Q4. This is still far above the 2010-14 average of 14%, but it was far below the airy heights of the previous three quarters. The European Vintage Championship results in April 2017 seemed to suggest that no action was needed. After all, the tournament was won by White Eldrazi, and the Top 8 looked diverse. There were only two decks in the Top 8 with multiple Gush, and other blue decks, like BUG and Grixis in the Top 8. And, although it was the most popular deck, Mentor represented about 20% of the metagame, hardly the benchmark for dominance. Workshop and Eldrazi Thorn strategies combined to be well above 20%, in contrast. But, at this point, the issue seemed to go beyond mere numbers. There was a perception in the metagame, justified or not, that Gush decks pushed out other blue decks, and, perhaps more importantly, that the metagame had been stagnant for too long. There had been four restrictions in under two years: two targeting Workshop decks, and two targeting these Gush tokens decks, and little had fundamentally changed. This bred discontentment in the metagame that seemed to demand change for change’s sake. Polls were generated on the large Vintage Facebook group and on TheManaDrain.com. On April 11, for example, Brian Kelly asked the Facebook group (a group I believe is generally representative of the global Vintage player base) whether there should be changes to the Vintage Banned and Restricted List, and if so, what? 141 people voted “yes,” and just 52 voted “no.” In other words, 61.7% of Vintage players polled in that group felt something needed to be done. Critically, however, there was a split among what people wanted restricted most. 119 voters wanted Monastery Mentor restricted (62%), while only 71 voters wanted Gush restricted (36.8%). In Vintage, the metagame has come to a bit of a standstill as Monastery Mentor decks face down their main predator, Workshop decks. The primary issue seems to revolve around the prevalence of free draw spells for the Mentor deck that let it churn through its library for no mana while creating an abundance of tokens. We believe by removing these free draw spells—and the perfect information that comes with Gitaxian Probe—we will significantly weaken Monastery Mentor–based strategies. Hopefully the move away from “free” spells in the Mentor decks will lessen the impact of the Workshop deck’s various Sphere of Resistance effects, opening up the metagame. It is telling that the restrictions of both Probe and Gush appeared to be largely framed in terms of the performance of Monastery Mentor. Mentor is mentioned four times in that explanation, but Gush isn’t even mentioned once. Now comes the kicker. “Gush” decks, meaning decks that feature the restricted Gush, and look in strategic appearance, shape or form, like the decks that would have played 3 or 4 Gush prior to the restriction, are currently 27.3% of Top 8s from the point of restriction through the end of the July. This doesn’t count the additional Mentor decks which don’t play Gush because they are playing Paradoxical Outcome or another engine. Even worse, looking just as Vintage Challenge results since the restriction, Workshop decks have risen, not fallen, to 38.8% of Top 8s, and Mentor strategies alone are still 32.3% of Top 8s. In other words, the restriction of Gush appears to have had little effect on Mentor decks impacting the metagame, and actually led to an increase in Shops. Take this Mentor deck, which I used to Top 8 the very first Vintage P9 Challenge after the restriction, and get 2nd place at the NYSE V in May. This deck is now possibly the best performing blue deck in the format. After 6 restrictions, four blue cards and two artifacts, the metagame appears largely similar in appearance to the one that existed since 2014 Q4. It’s impossible to know exactly what would have happened to Gush decks with a Mentor restriction this past April, but I argued in our podcast that the restriction of Mentor would have been more likely to reduce the dominance of Gush than the restriction of Gush would have on Mentor. That much is now clear, since Mentor is in nearly exactly the same spot it was before. It is possible, however, that restricting Mentor would still have left the “Gush” engine in a dominant position in the Vintage metagame. With Mentor restricted, Gush decks could revert to some number of Mentor substitutes, and still outperform many of the decks in the format. If so, it may have warranted action. But that is not what most Vintage players wanted, nor is it what I think the data since the restriction of Gush suggests should have happened. But there may be a deeper issue at work that goes beyond Gush or Mentor. At the very end of Chapter 3 of Understanding Gush, describing the GushBond Engine, I noted that the Dack-Delve engine had virtually superseded the GushBond engine in the vast majority of Gush decks, except for decks like Doomsday. This engine, however, deserves additional discussion now that Gush has been restricted. 1) To be able to quickly draw one of a few key draw spells: one of the two delve spells, Gush, or Ancestral. 4) Repeat Steps 2 and 3 until the game is won. Notably, however, it’s not enough to simply use all of your cantrips to dig. You also need cards that can dump superfluous cards into the graveyard. Dack Fayden does this most efficiently, but Jace, Vryn’s Prodigy can do this on a smaller scale as well. These filtering effects allow you to find the next draw spell more quickly than the opponent, and essentially function as reusable cantrips. Critically, however, all of the key sources of card advantage are now restricted, and yet this is, empirically, one of the best performing blue draw engine in the format, even surpassing in many events the success currently enjoyed by Paradoxical Outcome. The success of this draw engine raises difficult and thorny questions that must be confronted. If the Dack-Delve draw engine maintains the same position it enjoyed with Gush unrestricted, what can be done to address it? Restricting Mentor might weaken the deck it currently powers. Restricting Mentor might provide some insight into this question. Depending on the effect of a Mentor restriction, we will be able to gauge the extent of the relative power of Mentor itself versus the Dack-Delve draw engine. While I believe that restricting Mentor will significantly weaken the archetype, and the presence of the Dack-Delve draw engine in the format. It is nonetheless possible that this draw engine might still dominate the format even with Mentor restricted. This suggests the possibility that Preordain might also merit restriction at some point, and was already possibly more deserving than Gush. The reasons behind this are relatively straightforward. First, Preordain is often regarded as a superior spell to Ponder in Vintage, and Ponder is already restricted because of its interaction in Turbo-Xerox (TX) strategies (described in Chapter 1 of Understanding Gush). Its power level is arguably already equal to or greater than a card that currently sits on the Restricted List. Second, Preordain is the best unrestricted spell you can play after a Mentor is in play in the widest range of situations. It is the most efficient unrestricted spell that gives you the best chance of finding another spell you can play now. Restricting Preordain would have thereby weakened Mentor as well. Third, Preordain is the best unrestricted cantrip for TX strategies in Vintage, and the Dack-Delve engine in particular. It is possible that restricting Preordain would have weakened the TX game-plan, and thereby the Dack-Delve engine itself, by requiring additional lands to compensate or suboptimal cantrips such as Sleight of Hand, Opt, or Serum Visions as substitutes. I strongly suspect that had Mentor and Preordain been restricted prior to Gush, that Gush could be safely unrestricted and exist at some level between the pre-Khans level of performance and post-Khans level of performance. That is, of course, impossible to prove, but I think it would have been a better course for the direction of the format. There is a darker possibility, which I’ve already hinted. By relying on a Restricted List, Vintage has always had the danger of what used to be called a “critical mass” effect rendering the Restricted List ineffective as a policy tool for addressing a dominant deck. This was originally raised in the context of the Academy strategies, and later became a concern with Grixis type control decks using the evil Tinker/Yawgmoth’s Will/Time Vault trifecta referenced earlier. The way this argument works is this: it is theoretically possible that a deck can be essentially all restricted singletons except for mana and perhaps countermagic, and still remain a dominant deck in the Vintage format. Without bannings, unrestrictions, or new printings, there is nothing that more restrictions can do to diminish the position of such a deck from the format, in this hypothetical. Fortunately for Vintage, this possibility has never truly been encountered. Decks in the past that seemed to raise the specter of this were ultimately weakened by metagame developments, and this danger seemed to recede. The Dack-Delve draw engine, however, presents the most serious risk of this problem that has been encountered in many years. Even if Mentor, Preordain, and Gush are restricted, it is still possible to imagine that this engine, with a few additional substitutes, could remain the best blue draw engine in the format, and therefore anchor a dominant deck. I do not regard this as the most likely outcome, and do not raise this possibility to frighten, but to emphasize the importance of carefully thinking through the next steps in the handling of this format. We must confront the possibility that, at some point in this format’s progression, with twenty-five years of accumulated printings, that this could happen. Secondly, the danger or risk of this possibility suggests that we must look beyond immediate restrictions, and try to assess what could or should be done if additional, more immediate restrictions, don’t work. From this juncture, I see three possibilities. 2) Many more restrictions are necessary. 3) Unrestrictions to promote format diversity by boosting marginal decks or (re)introducing new decks. These possibilities are not mutually exclusive. It is possible that restricting Mentor will bring the Dack-Delve engine into a reasonable competitive balance with other engines, such as Paradoxical Outcome, Thoughtcast, Standstill, Jace, Thirst for Knowledge, Gifts Ungiven, Mystic Remora, and others. It is also possible, however, that restricting Mentor will fail to bring the Dack-Delve powered tokens deck into a competitive balance or that restricting Mentor will cause other decks to surge into a dominant position. The recent historical record shows that the restrictions of Treasure Cruise, Gush, and Probe caused Workshop decks to improve their performance, not subside. Mentor is one of the best cards that can be played against Workshop decks. It combines power with horizontal production that challenges the Workshop plan from multiple angles. Although Workshop decks may receive some boost from their role in preying on Gush decks, that would be more than offset by the boost they receive by weakening one of their metagame competitors. Restricting Mentor is most likely to strengthen Workshop’s overall metagame position, from an already dominant position. That might necessitate another restriction in the prison archetype. Such a restriction there might also elevate Paradoxical Outcome decks to an unhealthy position, and so on. Thus, possibility (2), a forecast of a parade of restrictions could be the most likely outcome of a Mentor restriction. After all, there have already been six restrictions along this path. This possibility is simply the slow-moving version of the 1999 wave of 18 restrictions targeting the Academy combo decks. Unrestrictions may be the most provocative, yet ultimately productive, option. Depending on how the managers of the format forecast the effect of their choices and weigh their options, unrestriction at least raise the possibility of boosting the fortunes of marginalized strategies, and thereby steal market share from Shops or Mentor. In particular, I would like to see Yawgmoth’s Bargain unrestricted, a card that is now fairly innocuous with Griselbrand, Dark Petition, and Ad Nauseum all providing similar effects, yet safely unrestricted. When discussing restrictions, both the DCI and the Vintage community tend to speak in generalities or in terms of a general direction in which we hope the metagame will move. But perhaps a more precise level of discussion is warranted. In the many debates over Mentor v. Gush, I suggested and forecast specific statistical ranges for the effect of either restriction. In a podcast and in writing, I predicted that the probability was greater that a Gush restriction would either leave Mentor’s numbers unchanged or increase them than it would bring them down. I have been proven correct, although that is a counterintuitive result. Most people reasonably assumed that restricting Gush would reduce Mentor’s prevalence, including the DCI. I predicted, at the same time, that restricting Mentor, however, would produce a 20-33% decline in Gush’s numbers, and possibly more, based upon some back-of-the-envelope math, of the % of Gush decks that employed Mentor, and a rough estimate of how many Mentor decks would switch to a non-Gush deck. But even the more conservative end of that range, if true, would have brought Gush decks down more than 6% points from 2017 Q1, to a more palatable range potentially. The key question should have been: what is the maximal tolerance threshold for Gush in the format? If the maximal tolerance level if somewhere around 20-25%, I view that as eminently achievable. Accordingly, I believe that the restrictions of Mentor and Preordain would have been reasonably expected to produce that result, quite easily. I firmly believed that a Preordain restriction would have had a statistically measurable impact on the prevalence of both Gush and Mentor in the metagame. It might not have been enough to satisfy critics of either card, but I don’t think it can be seriously denied that it would have had some impact. It’s even possible that restricting Mentor and Preordain would have brought – and kept – Gush under 20% of the Top 8 metagame, on average, as it was from 2010 until 2014 Q4. We are not accustomed to speaking and writing with that level of precision, but perhaps we need to be, going forward. Because the questions we confront now are not whether a particular restriction will rein in a problem, but more precisely how, and to what degree. Otherwise, we are going to have to confront the possibility that the wrong cards may be restricted and/or that many cards will be unnecessarily restricted. My concerns over unnecessary restrictions are not merely utilitarian objections, rooted in a view of Vintage as the final home for the game’s card pool and libertarian ethos that Vintage players embrace. Rather, my concerns are more consequentialist. This may seem counter-intuitive, but unnecessary restrictions in certain metagames make it more likely that additional restrictions will be required. There are two reasons for this. First, when the DCI restricts a card that is not the root problem, the root will eventually also need restriction. The restriction of Dark Ritual instead of Necropotence in ancient Extended is an example of this, but I also believe that the restrictions of Chalice before Golem and Gush before Mentor are two more recent examples (assuming Mentor is ultimately restricted). Second, restrictions weaken the ramparts and competition of the format, and make it more likely that an otherwise non-dominant deck or strategy becomes dominant. My greatest fear, at this point, is that serial restrictions to address the dominance of the Mentor and Workshop decks will ultimately lead to the restriction of Paradoxical Outcome, a card that one can easily imagine rising to unhealthy metagame performance, yet would have remained unlikely if Gush were unrestricted to compete with it. Let’s hope that with careful planning and better management that eventuality can be avoided. Few players want to see a parade of restrictions. There is one other topic that I wish to address. In Understanding Gush, I only briefly touched on how Gush might be used as a singleton. That is obviously a much more important topic now than its treatment there. As we have already seen, Gush remains a Vintage staple, even as a restricted spell. Projecting to the future, Gush can be expected to appear in virtually all of the range of strategies covered in Chapter 4, and the range of archetypes covered in Chapter 12. Its most important function, currently, as discussed above, is as part of the Dack-Delve engine. It will remain a critical part of this engine for the foreseeable future. It also gains substantial reuse value from Jace, Vryn’s Prodigy that it did not enjoy from Snapcaster Mage. But there are other places that Gush may appear. Gifts Ungiven, now an unrestricted spell, can use Gush effectively as a singleton. Gifts decks can tap out to play Gifts, and get value from creating an additional land drop. Although you cannot achieve all of the advantages that can be derived from Gush in such shells, it is nonetheless a source of card and mana advantage in certain Gifts piles. It can also boost storm as productively as almost any other spell. Even as a singleton, Gush has a home in the Vintage format now and, hopefully, forever. For that reason, I am able to say, with all sincerity, that, in addition to the general insights into the Vintage format, the guidance provided in Understanding Gush on how to design, play, metagame, operationalize, or combat Gush strategies remains a key to success in Vintage. In fact, only a single chapter, on the GushBond engine, and the Appendix are now somewhat obsolete for contemporary players. So be sure to check it out if you haven’t already, and maybe someday we’ll be able to play Gush as a four-of again.